Shuttle is an excellent little Mac app for those who frequently use SSH to connect to remote or local servers. It’s functionality is very simple: you gain a little SSH menu bar item that pulls down to give you super-quick access to whichever servers you have configured. Selecting one of the servers immediately launches terminal and connects through SSH. 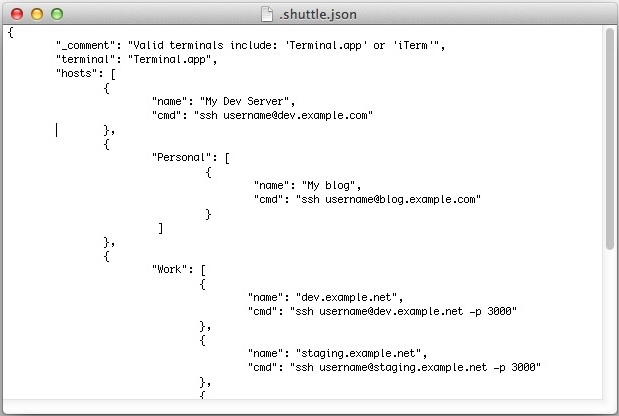 Configuration of the menu bar is done through a json file that sits in your home directory, named .shuttle.json. Create new submenu server groups, add new servers, modify existing ones, you can even change the default terminal app from Terminal to iTerm if you prefer to use that. Simple and easy, Shuttle is even faster from a blank OS X desktop than using the standard alias approach, the Terminal app bookmarks, or even ssh shortcuts through a config file. By the way, if you’re interested in quickly testing this app out, you can always start a local SSH server on your Mac or another nearby using the Remote LoginM feature and adjusting the configuration file for either a localhost or LAN connection.